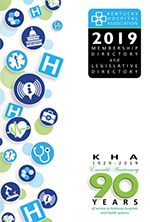 The Kentucky Hospitals’ Circle of Friends is the political action committee (PAC) of the Kentucky Hospital Association (KHA). Circle of Friends supports candidates in Kentucky’s elections and supports federal candidates through the American Hospital Association Political Action Committee (AHAPAC). Hospital PACs are limited to soliciting contributions from hospital leadership and trustees. KHA and the American Hospital Association can only accept contributions from people associated with their members. Neither PAC can accept corporate contributions. This also means that all contributions must be made by personal check or personal credit card. Make sure you're logged in, then click below for more information!